Hippocrates, the father of medicine, taught his students 2,500 years ago, “Let food be your medicine.” While you probably think of pumpkins only as decorations for Halloween and Thanksgiving, their seeds provide a potent combination of vitamins, minerals, and other health-promoting nutrients. Pumpkins (Cucurbita pepo) are native to North America, where the American Indians traditionally prized these large orange gourds for their nutritional and multi-functional uses. New information indicates that the pumpkin seed may be a powerful functional food that is particularly effective for treating bladder dysfunction, and might also help in treating and preventing heart disease, osteoporosis, and arthritis. Many people in middle age and beyond are plagued by urinary problems that often disturb their sleep. They are awakened one or more times nightly with the urge to urinate. Though many of these people resort to prescription medications for this problem, a handful of pumpkin seeds daily might be a safer and more effective treatment. Pumpkin seeds appear to be remarkably effective in treating overactive bladder, a condition that causes a sudden urge to urinate and can sometimes result in mild urinary incontinence. Studies show that about one in six adult men and women suffer with symptoms of overactive bladder including urinary urgency, and frequent daytime and night urination. An overactive bladder can disturb sleep and reduce overall enjoyment of life. Encouraging results have been reported in both animal and human studies using pumpkin seeds for treating overactive bladder, showing significant decreases in the number of daytime and nighttime urinations and improved quality of sleep. Furthermore, pumpkin seeds appear to provide significant relief for aging men dealing with urinary problems caused by BPH (benign prostatic hyperplasia), or an enlarged prostate. One study found that a pumpkin seed extract used for three months in 53 men ages 50 to 80 years old increased urinary flow volume (urine stream) by 40 percent and decreased nighttime urinary frequency 30 percent, compared with those on placebo. 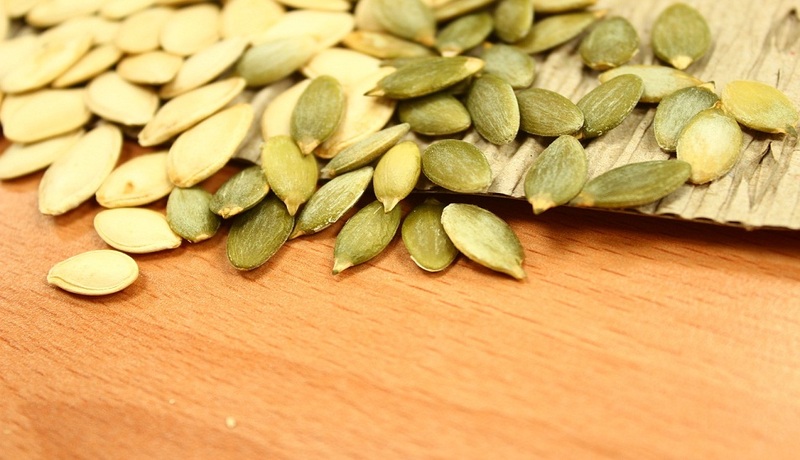 Pumpkin seeds appear to improve several cardiovascular disease risk factors. Studies of animals and humans show that pumpkin seeds can reduce cholesterol, especially the bad LDL cholesterol. Pumpkin seed oil has also been found to have favorable effects on the HDL, or good cholesterol. In one randomized controlled study, pumpkin seed oil caused a 16 percent increase in HDL cholesterol levels and a 7 percent drop in diastolic blood pressure levels, probably through the positive effects on the production of nitric oxide, a beneficial compound made by the lining of healthy young blood vessels.